I have been so busy trying to decorate 2 houses The Witchdoctor House ( shown above) and the Buccaneer House I simply forgot this weeks post. Not to worry Tales of Mina De Bouff has something in store for talk like a pirate day. I'm hoping to have this house finished and posted before then. 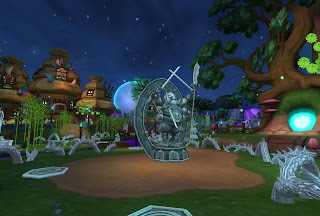 Pirates if you have a Pirate101 house that you would like to showcase Send me a message at Paige@Paigemoonshade.com. (If you are under the age of 13 make sure to have your parents or guardians permission).